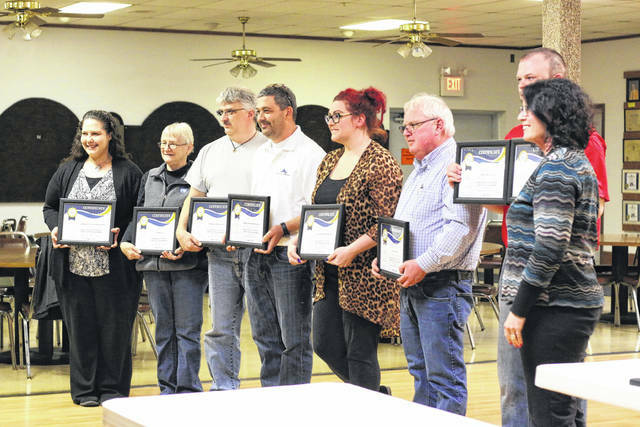 GALION — Galion Safety Council held its 2018 Annual Awards Program on Thursdayat the Galion Moose Lodge on South Market Street. Twenty-six businesses were presented with awards by Michelle Francisco from the Ohio Bureau of Worker’s Compensation Division of Safety and Hygiene. All 26 business received the ‘100 percent Award’ for completing 2017 with zero injuries or illnesses that resulted in a day or more away from the workplace. There were a total of 6 ‘Group Award’ recipients, who all had the lowest incident rate in their designated Safety Council Group for 2017, while another 6 business were acknowledged with the ‘Achievement Award’ for lowering their incident rate by a minimum of 25% from the previous year. The final group of businesses to be recognized were presented with the ‘Special Award’ for those who work a minimum of 500,000 hours and at least 6 months without an injury resulting in a day or more away from work. Galion businesses receiving this award were Central State Enterprises, Covert Manufacturing, Galion City Schools, Northern Ohio Pizza Company, Schilling Graphics, Tramec LLC, and Lifetouch Church Directories. Francisco made special mention of Lifetouch Church Directories for their total of 2,137,407 hours without an injury at their location. This was the longest span without injury of any business in attendance. The speaker for the event was Jared Cass, director of Avita’s Occupational Medicine WorkWell Division. Cass spoke to those in attendance both lightheartedly yet effectively about the importance of creating a positive work environment for employees and how that relates to the number of Worker’s Compensation claims a business may experience. The luncheon concluded with Safety Council member Ned Rieke, President of Urban Industries, who thanked those in attendance and also acknowledging the hard work of each business to reduce claims and do better for their employees on a daily basis. Erin Miller | Galion Inquirer Galion Safety Council held its annual Awards Luncheon on Thursday, presenting numerous Galion businesses with awards in recognition of their efforts in keeping their workplaces accident free in 2017.
https://www.galioninquirer.com/wp-content/uploads/sites/38/2018/04/web1_IMG_0345.jpgErin Miller | Galion Inquirer Galion Safety Council held its annual Awards Luncheon on Thursday, presenting numerous Galion businesses with awards in recognition of their efforts in keeping their workplaces accident free in 2017.